The latest index reading came in at -6.49, down from -6.09 the previous week. 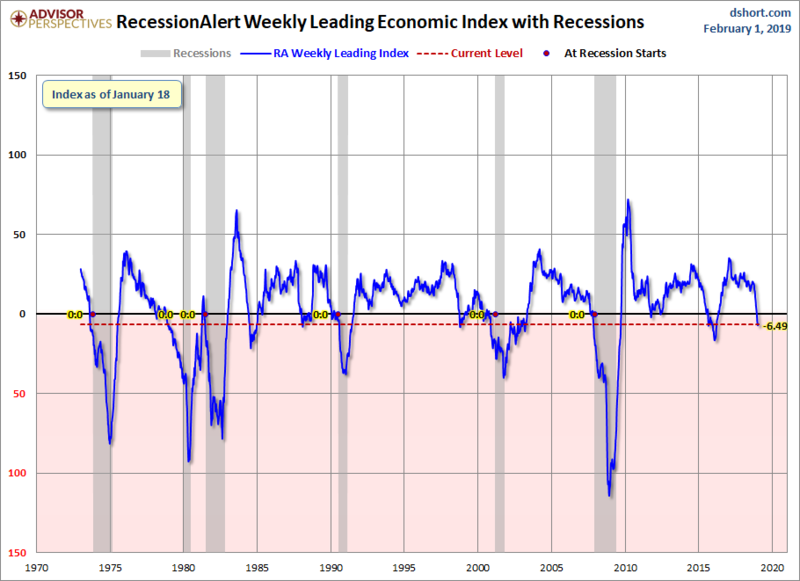 RecessionAlert launched an alternative to ECRI's Weekly Leading Index Growth indicator (WLIg). The Weekly Leading Economic Index (WLEI) uses fifty different time series from these categories: Corporate Bond Composite, Treasury Bond Composite, Stock Market Composite, Labor Market Composite, Credit Market Composite. 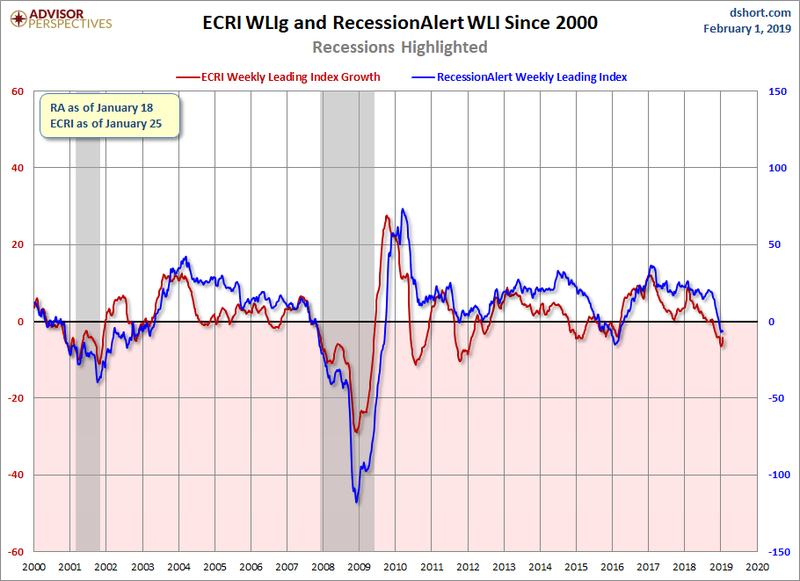 RecessionAlert emphasizes that WLEI is a growth index and its data is no more than a week old, as is ECRI's WLIg. Being a weekly growth index, it provides data with at most a 1-week lag, which is far more timely than the lag found on monthly economic indicators. Additionally, it is published on Thursday afternoons, a full 18 hours before the widely known ECRI Weekly Leading Index. As with all weekly indices though, the data is far more volatile than monthly or quarterly indicators and the WLEI components are therefore subject to more false positives (calling recession when one does not occur.). The WLEI is heavily weighed toward financial market data, but the obvious advantage of this is that data revisions are minor and isolated to the Labor Market Composite and small portions of the Credit Market Composite. The first chart uses data going back to 1973 and includes recession starts. Here we've zoomed into the turn of the century and added in ECRI's WLIg for comparison. As you can see, the ECRI indicator has repeatedly shown conspicuous contractions between recessions, enough to make an erroneous recession call while the WLEI did not trigger such a call. Both indicators generally move in the same direction, but the WLEI less volatile. Let's look at the comparison with GDP growth since 1970. As you can see, not all negative GDP and slow growth have been matched by the WLEI, but all recessions match.